Windows XP users should backup or copy their user profiles once in a while so that it can be restored in the event the profile gets corrupted. Profile Copier is a free tool using which you can backup your Windows XP user profile to a different location. 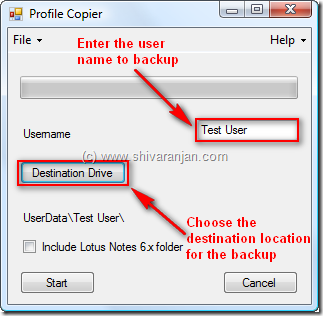 To backup a Windows XP user profile just enter the user name and select your backup location, if you would like to backup your lotus notes folder use the ‘Include Lotus Notes 6.x folder’ option to include that as well. Now the using the ‘Start’ button you can start the user profile backup process and it will completed based on the size of the user profile. This tool does not require any installation hence can be carried in a portable drive. Tout d’abord bonjour…. Ce ticket est très informatif. je voulais notamment des réponses sur le sujet. based worldwide and similarly they have based buyers internationally. for the Timber and Wood area shall be motivated to talk about. Tout d’abord bonjour…. Ton site est très bien documenté. je cherchais justement des réponses a ce sujet. I was wondering if you ever thgought of changing the layout of your site? Its very well written; I loce what yoive got to say. But maybe you could a little more in thhe way of content so people could connect with it better. Youve got an awful lot of text ffor only having 1 or 2 pictures. farming. Humana People to People represents a wide range of different activities and tasks within poverty-stricken regions of countries throughout the world. to confront the important troubles that they encounter now. The Humana People to People Motion works jointly with The Federation for Corporations in the Yunnan province of China. The job first commenced within 2005 and continues over now. are able to expand their education, preparing them to get work opportunities, giving details on infectious illnesses and many more. and Child Aid activity was then started in Zhenkang. along with a lot more than 128 communities. Together with 280 cumulate recipients, People to People gives wish and also a better future to these poverty-stricken countryside places. able to aid those who are short of funds with their non-profit aid organizations. The Humana People to People Movement works with The Federation for Corporations within the Yunnan area in China. improve capital to be able to achieve a variety of projects across the province in poor regions. jobs, offering information on transmittable diseases and even more. how you center yourself annd clar youur thoughts prior to writing. I have had difficulty clearing my thhoughts inn getting my thoughts outt there. web site regularly, this web site is in fact good and the viewers are genuinely sharing good thoughts. have to do a number of adjustments in your lifestyle.